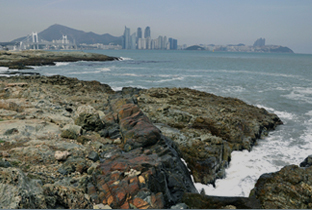 Busan, Korea’s second largest city and world 5th busiest port, is an ineffable world-class city where exciting contemporary lifestyle meets long-standing history. Also, Busan is home to 3.5 million residents who have retained their friendly charm and generous hospitality of the countryside. 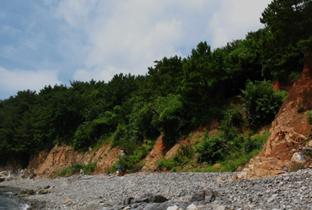 Nakdong River, which starts from Taeback of Gangwon Province, runs down around 525km towards south, drenches graceful mountains & fertile fields and creates back marshes such as Upo Swamp and Junam Reservoir. 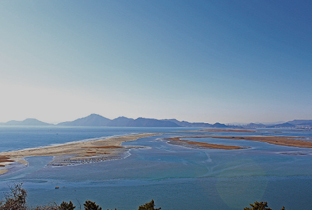 The Nakdong River Estuary has well-formed small & large sized deltas such as Eulsukdo, Ilwoongdo, Daemideung, Jangjado, shinjado, Jinwoodo, Baekhapdeung, Doyodeung, etc, and along with these deltas, the tidal flat and the forest of rank reeds around the estuary have been good habitats for migratory birds. The peripheral area of the estuary where the sea water meets the river water and the shallow tidal flat is widely formed, thus lots of planktons, fishes, shellfishes and aquatic and aquatic insects propagate provides migratory birds with abundant prey. 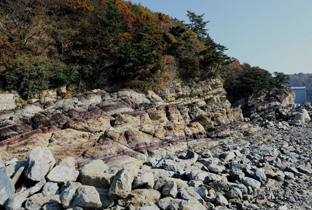 Taejongdae Cliffed Coast is one of Busan’s major scenic spots featuring beautiful rocky cliffs, black pine forests, and spectacular rock formations. It is also famous for its eroded sea caves and eroded cliffs that create beautiful topography. The vegetation is impressive as well, featuring forests of black pine and Japanese hackberry -- a good example of what is found in the southern part of the country. An orbicular bead is a stone that is round like a ball and is formed under particular environmental conditions. Orbicular beads are mostly found in granite. This stone is rare, serving as special data for geology and as important data in researching how rocks are formed. 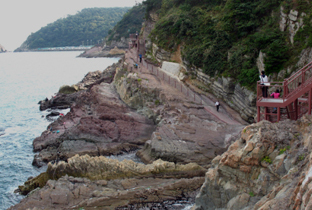 The gabbroid in Jeonpo-dong in Busan is an orbicular bead in a gabbro with length of 400m and width of 300m. Orbicular beads have diameter of 1~ 10cm and dark grey or light grey color. 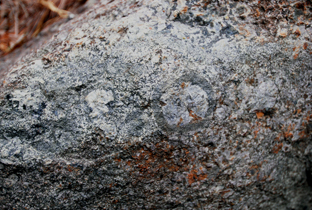 Most orbicular beads are found in granite, but the orbicular bead in Jeonpo-dong is found in a gabbro. The gabbroid has high research value because it is found intact. 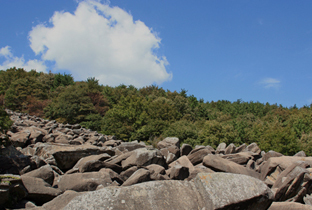 The orbicular gabbro in jeonpo-dong is designated and conserved as a Natural Monument because it is a rare rock reported only to the scientific world in Asia. 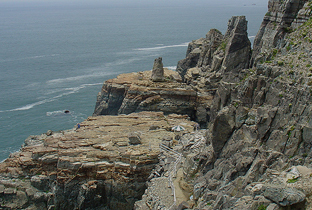 A group of rocky islets, Oryukdo Islets are located approximately 600 meters south-southeast of Seungdumal on the northern shore of Busan. 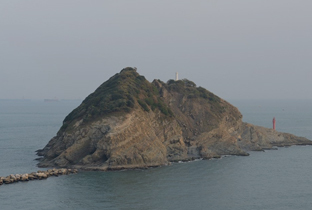 Located side by side, the five islets look like six when viewed at high tide from Busan since one of the islets is submerged, leaving its two peaks above the sea; hence the name Oryukdo, meaning "five or six islets." 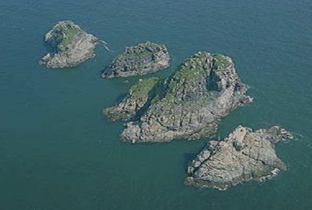 From the nearest to the mainland, the islets are Usakdo (divided into Bangpaeseom and Solseom Islets at high tide), Suriseom, Songgotseom, Gulseom, and Deungdaeseom. Each has exquisite natural scenery featuring almost vertical coastal cliffs, marine plateaus, and sea caves created by wave erosion. The exotic marine topography, wild flora and fauna untouched by humans for a long time, and blue sea constitute the islets' fascinating environment. The sea route in front of the islets occupies an important place in the nation's history of maritime transportation. The construction of Bulguksa Temple, located at Tohamsan Mountain, Gyeongju, was started in 751 (the 10th year of the reign of King Gyeongdeok of Silla) and completed in 774 (the 10th year of the reign of King Hyegong of Silla). Most of the buildings within the temple, except for Geungnakjeon Hall, Jahamun Gate, Beomyeongnu Pavilion and a few others, were burned down during the Japanese invasion in 1593. The present condition of the temple is the result of restoration work carried out between 1969 and 1973. The main features of the temple include two three-story stone pagodas, Dabotap and Seokgatap, which date back to the Unified Silla Period; two stone bridges, Cheongungyo (Blue Cloud Bridge) and Baegungyo (White Cloud Bridge), leading to Jahamun Gate; and two stone bridges, Yeonhwagyo (Lotus Flower Bridge) and Chilbogyo (Seven Treasure Bridge), leading to Geungnakjeon Hall, all of which have been designated as national treasures. 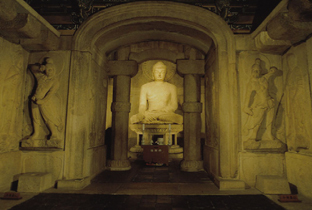 Many cultural heritage items, including the Gilt-bronze Seated Vairocana Buddha kept in Birojeon Hall and the Gilt-bronze Seated Amitabha Buddha kept in Geungnakjeon Hall, attest to the splendid Buddhist culture of that period. 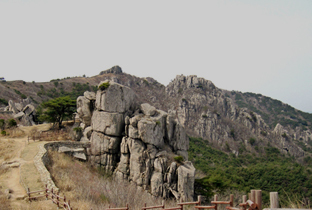 The temple, along with Seokguram Grotto, was registered on the UNESCO World Heritage List in December 1995. 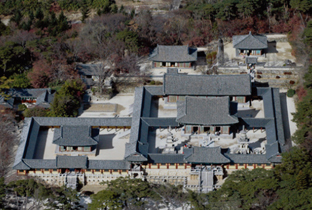 The construction of Seokguram Grotto was begun in 751 under the leadership of Prime Minister Kim Dae-seong during the reign of King Gyeongdeok of the Silla Dynasty, and was completed in 774 (the 10th year of King Hyegong’s reign), whereupon it was given its original name of Seokbulsa Temple. Buddhist art reached its peak during King Gyeongdeok’s reign, which spanned the middle period of the Silla Period, Besides Seokguram Grotto, many other cultural treasures were built during this period, including Bulguksa Temple, Dabotap Pagoda, the Three-story Stone Pagoda of Bulguksa Temple, and the Bell of Hwangnyongsa Temple. 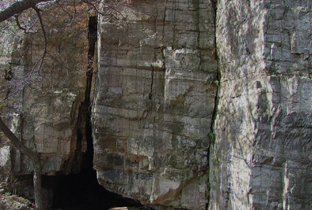 The artificial stone grotto was built halfway down Tohamsan Mountain with pieces of white granite. The principal statue of Sakyamuni Buddha was placed at the center of the grotto, and forty statues of various bodhisattvas, Buddha’s disciples, and guardian kings were carved on the surrounding walls, though only thirty-eight of them remain.